Cover artwork: 15-century fresco of The Trinity from Atri Cathedral. 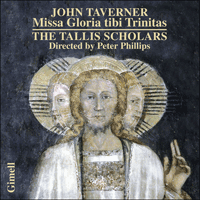 Taverner’s Missa Gloria tibi Trinitas counts as one of the greatest pieces of music ever to have been written in England. 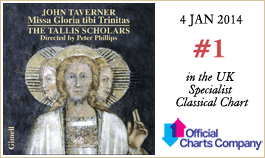 If one thinks of the melodic beauty of a Britten opera, the variety contained in an Elgar symphony or the sheer invention of a Purcell anthem, Taverner matches them at every point. Not only is his grasp of all the techniques available to him faultless, in this work, and especially in its ‘in nomine’ section, he also set the scene for several generations of composers to come. It is a monumental challenge for its six voices – treble, mean, two countertenors, tenor and bass – to perform. With its exceptionally wide-ranging voice-parts, little else taxes its interpreters as Taverner does here. The challenge is partly in the tessitura – the trebles go unusually high; both countertenor parts range unusually widely from top to bottom of their ranges; and although the means, tenors and basses are more normal, it requires constant sensitivity to maintain the necessary balance between all six parts. And of course there is a challenge in the sheer virtuosity of the writing. The final passage of the Gloria is an example: who else would have thought of those thrilling scales, building and building to the final cadence? Not Fayrfax – or Josquin. A further challenge comes in the way Taverner liked to construct his sections over breathtakingly long spans. To master these the performers need to understand not only how to phrase each small component motif – that is straightforward – but also how he fashioned them into prolonged sequences, which many bars later build to a final cadence. The most sustained example of this is in the last twenty-five bars of the first Agnus; the most action-packed is the bass-generated ‘descendit de caelis’ in the middle of the Creed. But Taverner was also interested in maintaining coherent musical arguments over long passages without the consistent use of motifs – the ‘in nomine’ of the ‘Benedictus’ is a classic example. The subsequent fame of these fifty-six bars has never been fully explained, but it must have come in the first instance from their intrinsic beauty, which itself comes from how artlessly Taverner held his material together. The Gloria tibi chant is quoted without interruption in equal note-lengths, so every listener can clearly hear it. Sung by the means – the second voice down – it sets a timeless mood, the epitome of calm, as the other three voices wind round it, coming and going seemingly on a whim. Nothing could be less demanding, nor more detached from its surroundings – a point of repose in an otherwise busy world, which the following Hosanna quickly returns us to. The presence of a chant dedicated to the Trinity suggests that the Mass was originally composed to be sung on Trinity Sunday, though it is just as possible that it was simply written for a foundation dedicated to the Trinity. This was in fact the case with both of Taverner’s main places of employment before 1530 – Tattershall Collegiate Church and Cardinal College (later Christ Church) Oxford – which means we have no certain evidence of where the Mass was first performed. However since the setting is the first item in the Forrest-Heyther part-books, which have always been associated with Cardinal College, it seems likely that he wrote it there. The chant is quoted twice in all the movements (except the Sanctus, where it occurs three times, thanks to the ‘in nomine’) according to a repeating pattern: once, interrupted and in very long notes, in the full sections; and then once in punchy short notes in all the final sections, always in the mean. These final sections seem to be turbo-powered by their chant notes – ‘Et exspecto’ at the end of the Credo is an example – though the ‘dona nobis pacem’ at the end of the Agnus, with its lilting triple-time, is a beautiful exception. If Taverner was at Cardinal College when the Mass was copied, he might well have overseen what was written down, and indeed this original does seem to be unusually accurate. It is a pity the Forrest-Heyther part-books do not contain Taverner’s brilliant set of Magnificats, since the only one which is complete is the four-voice, and that comes from a manuscript which dates from thirty years after his death. The five-voice lacks its second tenor part throughout, and the six-voice its treble for much of the time. In fact, however, these omissions hardly seem to dent the achievement of Taverner’s settings: partly because the tenor part in the five-voice can be largely supplied from chant; partly because the treble part in the six-voice is original in the last section, where the coloratura writing really hits its stride; and partly because Tim Symons, our editor, has done a superlative job in writing the missing notes. It seems that these Magnificats were not intended as a set, in the way that Byrd’s three Masses, with their complementary scorings, were planned. It is assumed that the five-voice is the earliest, since it follows the older practice of writing the polyphony around a faburden of the plainsong melody, instead of the plainsong itself. However in the four- and six-voice settings Taverner did use the original Psalm tones, a technique which guaranteed a clearer presentation of the melody and one which was gaining favour in the early years of the sixteenth century. The three make an intriguing set. The five-voice is the calmest, with its low-voice scoring of sattb, while being argued at the greatest length. Indeed the part-writing at times seems almost medieval in its meandering style, reminding the listener of late fifteenth-century settings. The four-voice is the opposite: compact, full of points of imitation (which suggest a later date of composition), every gesture considered and dramatic. It is left to the six-voice setting to provide the most appropriate foil to the Missa Gloria tibi Trinitas, with its choir of TrMAATB and brilliant full sections. All Taverner’s sense of architecture is deployed here, as he builds to the astonishing roulades of the ‘Gloria Patri’. What he was trying to rival here, as he sends all the parts spinning around each other, is anyone’s guess, but of the previous generation the Magnificat of William Cornysh comes to mind. Yet if anything Taverner outwrites even that most taxing of endings, and in the process gives us some of the most virtuosic choral writing ever penned. La Missa Gloria tibi Trinitas de Taverner est l’une des plus grandes œuvres musicales jamais écrites en Angleterre: elle a la beauté mélodique d’un opéra de Britten, la variété d’une symphonie d’Elgar, la pure invention d’un anthem de Purcell. Avec elle, Taverner, doué d’une impeccable compréhension de toutes les techniques alors disponibles, planta (surtout dans la section «in nomine») le décor pour plusieurs générations de compositeurs. Cette messe est un monumental défi pour les six voix – treble, mean, deux contre-ténors, ténor et basse – chargées de l’interpréter. Avec ses parties vocales d’une ampleur exceptionnelle, elle éprouve ses interprètes comme rarement. Le défi tient en partie à la tessiture: les trebles montent inhabituellement haut; les deux parties de contre-ténors parcourent exceptionnellement toute leur étenudu, de l’aigu au grave; et même si les means, les ténors et les basses sont davantage dans la norme, il faut une sensibilité de chaque instant pour préserver l’indispensable équilibre entre les six parties. Sans oublier, bien sûr, le défi inhérent à la pure virtuosité de l’écriture, comme l’illustre le passage final du Gloria: qui d’autre aurait songé à ces gammes saisissantes, se développant pas à pas jusqu’à la cadence conclusive? Pas Fayrfax – ni Josquin. Autre défi : la manière dont Taverner aimait à bâtir ses sections sur des pans d’une longueur époustouflante. Pour les maîtriser, les interprètes doivent comprendre comment phraser chaque petit motif constitutif – ce qui est simple – mais aussi comment tous furent modelés en séquences prolongées qui, des mesures plus tard, aboutissent à une cadence terminale. L’exemple le plus prolongé se trouve dans les vingt-cinq dernières mesures du premier Agnus, le plus fourni étant le «descendit de caelis» généré par la basse, au milieu du Credo. Mais Taverner s’attacha également à préserver, sur de longs passages, des arguments musicaux cohérents sans user contamment de motifs – ce dont l’«in nomine» du Benedictus nous offre un exemple classique. La renommée dont jouiront ces cinquante-six mesures n’a jamais été complètement expliquée, mais elle a sûrement dû découler, d’abord, de leur beauté intrinsèque, fruit de l’ingénuité avec laquelle Taverner lie son matériau. Le plain-chant Gloria tibi est cité sans interruption en longueurs de note égales, si bien que chacun peut clairement l’entendre. Chanté par les means – deuxième voix en descendant –, il instaure un climat intemporel, la quintessence du calme, alors que les trois autres voix serpentent autour, allant et venant à leur guise. Rien ne saurait être moins exigeant, ni plus détaché de son environnement – un moment de répit dans un univers par ailleurs chargé, auquel l’Hosanna suivant nous ramène bien vite. La présence d’un plain-chant dédié à la Trinité suggère que cette messe fut originellement composée pour la fête de la Trinité; mais il se peut tout autant qu’elle ait été juste écrite pour une institution dédiée à la Trinité – ce qu’étaient, en réalité, Tattershall Collegiate Church et Cardinal College (futur Christ Church), les deux principaux endroits où Taverner travailla, à Oxford, avant 1530 –, si bien que rien ne permet de dire avec certitude où elle fut exécutée pour la première fois. Cependant, comme elle apparaît en premier dans les parties séparées de Forrest-Heyther, de tout temps associées à Cardinal College, il semble probable qu’elle ait été écrite là. Le plain-chant est cité deux fois dans tous les mouvements (sauf dans le Sanctus, où il revient trois fois, grâce à l’«in nomine»), selon un modèle répétitif: une fois, interrompu et en valeurs très longues, dans les sections chorales; puis une fois, en notes brèves incisives, dans toutes les sections finales, toujours au mean. Ces sections-là paraissent boostées par leurs notes de plain-chant – ainsi «Et exspecto», à la fin du Credo –, encore que le «dona nobis pacem» concluant l’Agnus, avec son allante mesure ternaire, fasse magnifiquement exception. S’il se trouvait à Cardinal College quand cette messe fut copiée, Taverner a fort bien pu superviser ce qui a été consigné – et de fait, cet original semble d’une rare exactitude. Quel dommage que les parties séparées de Forrest-Heyther ne renferment pas aussi le brillant corpus de magnificat de Taverner – celui à quatre voix étant le seul à nous être parvenu complet, via un manuscrit postérieur de trente ans à la mort du compositeur. Il manque à celui à cinq voix toute la partie de second ténor et à celui à six voix l’essentiel de son treble. Mais, au vrai, ces manques ne paraissent guère entamer la réalisation de Taverner: il faut dire que, dans le Magnificat à cinq voix, la partie de ténor peut être largement fournie par le plain-chant et que, dans celui à six voix, la partie de treble est originale dans la dernière section, où l’écriture colorature trouve véritablement son rythme; enfin, Tim Symons, notre éditeur, a accompli une tâche sans pareille en écrivant les notes manquantes. Ces magnificat ne semblent pas avoir été conçus comme un corpus, comme cela avait été le cas pour les trois messes de Byrd, aux distributions vocales complémentaires. Celui à cinq voix serait le plus ancien, vu qu’il adopte la vieille pratique consistant à écrire la polyphonie autour d’un faux-bourdon de la mélodie grégorienne, et non du plain-chant. Dans ceux à quatre et à six voix, en revanche, Taverner utilisa les tons psalmodiques originaux, une technique qui garantissait une plus claire présentation de la mélodie et était de plus en plus prisée dans les premières années du XVIe siècle. Ces trois magnificat font un curieux corpus. Celui à cinq voix est le plus paisible, avec sa distribution grave (SATTB), mais aussi le plus sujet à débat, tant sa conduite des parties semble presque médiévale en son style flexueux, rappelant à l’auditeur les mises en musique de la fin du XVe siècle. Celui à quatre voix est son exact contraire: compact, truffé de passages imitatifs (indice, peut-être, d’une date de composition ultérieure), où chaque geste est pesé, dramatique. Il revient au Magnificat à six voix, avec son chœur TrMAATB et ses brillantes sections chorales, d’offrir le meilleur repoussoir à la Missa Gloria tibi Trinitas. Taverner y déploie tout son sens de l’architecture, lorsqu’il échafaude les étonnantes roulades du «Gloria Patri». Ce qu’il tenta d’égaler ici, en envoyant toutes les parties se tourner autour, Dieu seul le sait, mais si l’on cherche dans la génération passée, c’est le Magnificat de William Cornysh qui nous vient à l’esprit, avec sa conclusion extrêment ardue que Taverner surpasse pourtant dans ce qui est l’une des écritures chorales les plus virtuoses jamais couchées sur le papier. Die Missa Gloria tibi Trinitas von Taverner zählt zu den größten Werken, die jemals in England komponiert worden sind. Wenn man an die melodische Schönheit einer Britten-Oper, die Mannigfaltigkeit einer Symphonie von Elgar oder die reine Erfindungsgabe in einem Purcell-Anthem denkt, so kann Taverner sich mit diesen in jedem Punkt messen. Er beherrscht nicht nur die ihm zur Verfügung stehenden Techniken tadellos, sondern schafft in diesem Werk, insbesondere in dem „in nomine“-Abschnitt, auch optimale Voraussetzungen für ganze Generationen von Komponisten nach ihm. Die Aufführung dieses Werks bedeutet für seine sechs Stimmen – Treble [Knabensopran], Mean [Knabenalt], zwei Countertenöre, Tenor und Bass – eine erhebliche Herausforderung. Dabei sind die bemerkenswert weitreichenden Stimmpartien deutlich anspruchsvoller als in vielen anderen Werken. Die Herausforderung liegt dabei einerseits im Stimmumfang – die Trebles gehen ungewöhnlich weit in die Höhe, beide Countertenor-Partien reichen in beide Extreme ihres Ambitus’ und obwohl die Anlage der Mean-, Tenor- und Bass-Stimmen eher der Norm entsprechen, ist hier ein besonderes Feingefühl vonnöten, so dass zwischen allen sechs Stimmen das Gleichgewicht gehalten wird. Und natürlich liegt in der Virtuosität des Kompositionsstils ebenfalls eine Herausforderung. Die letzte Passage des Gloria ist dafür ein passendes Beispiel: wer wäre sonst darauf gekommen, derart mitreißende Tonleitern zu komponieren, die sich unaufhaltsam auf die Schlusskadenz hinbewegen? Jedenfalls nicht Fayrfax – und auch nicht Josquin. Noch eine weitere Herausforderung liegt in der Konstruktion der Abschnitte, die Taverner gerne sehr weit spannte. Um diese zu meistern, müssen die Ausführenden nicht nur wissen, wie jede kleine Motiveinheit zu phrasieren ist – doch ist das nicht weiter schwierig –, sondern sie müssen auch verstehen, wie er diese in verlängerte Sequenzen umarbeitete, die sich viele Takte später auf eine Schlusskadenz hinbewegen. Das ausdauerndste Beispiel hierfür findet sich in den letzten 25 Takten des ersten Agnus Dei; das rasanteste ist das vom Bass erzeugte „descendit de caelis“ in der Mitte des Credos. Taverner bemühte sich allerdings auch darum, schlüssige musikalische Argumentationen über lange Passagen hinweg zu führen, ohne dabei durchgängig Motive einzusetzen – das „in nomine“ des „Benedictus“ ist hierfür ein klassisches Beispiel. Der spätere Ruhm dieser 56 Takte ist nie völlig erklärt worden, doch muss sich dieser in erster Linie sicherlich aus ihrer immanenten Schönheit herleiten, die wiederum von der natürlichen Art und Weise herrührt, mit der Taverner sein Material zusammenhält. Der Gloria tibi Trinitas-Cantus wird ohne Unterbrechung in gleichen Notenlängen wiedergegeben, so dass alle Zuhörer ihn gut hören können. Er wird von den Mean-Stimmen – die zweite Stimme von oben – gesungen und es stellt sich eine zeitlose Stimmung ein, der Inbegriff der Ruhe, während die anderen drei Stimmen sich darum herumwinden und scheinbar willkürlich kommen und gehen. Nichts könnte weniger fordernd oder von seiner Umwelt noch losgelöster sein – ein Ruhepunkt in einer ansonsten geschäftigen Umgebung, zu der das folgende Hosanna uns rasch zurückführt. Die Tatsache, dass hier ein Cantus planus erklingt, der der Dreifaltigkeit gewidmet ist, deutet darauf hin, dass diese Messe ursprünglich für eine Aufführung an Trinitatis komponiert wurde – obwohl es ebenso möglich ist, dass sie einfach für eine Einrichtung entstand, die der Dreifaltigkeit gewidmet war. Das war bei den beiden Hauptanstellungen Taverners vor 1530 der Fall – Tattershall Collegiate Church und Cardinal College (später: Christ Church) Oxford –, was bedeutet, das uns keine eindeutigen Hinweise darauf vorliegen, wo die Messe erstmals aufgeführt wurde. Da die Vertonung jedoch das erste Werk in den Forrest-Heyther-Stimmbüchern ist, die stets dem Cardinal College zugeordnet worden sind, darf man wohl annehmen, dass er die Messe dort komponierte. Der Cantus wird in allen Sätzen zweimal zitiert (mit der Ausnahme des Sanctus, wo er aufgrund des „in nomine“ dreimal vorkommt), was sich nach einem wiederkehrenden Muster richtet: einmal, mit Unterbrechungen und in sehr langen Noten, in den vollbesetzten Abschnitten, und dann einmal in ausdrucksstarken kurzen Notenwerten in allen Schlussteilen und immer in der Mean-Stimme. Diese Schlussteile scheinen durch die Cantus-Töne besonders starken Antrieb zu erhalten – „Et exspecto“ am Ende des Credos ist ein Beispiel dafür –, obwohl das „dona nobis pacem“ am Ende des Agnus Dei mit seinem wiegenden Dreiertakt eine wunderschöne Ausnahme bildet. Wenn Taverner am Cardinal College war, als die Messe kopiert wurde, ist es gut möglich, dass er die Verschriftlichung beaufsichtigte und tatsächlich scheint dieses Original ungewöhnlich akkurat zu sein. Es ist bedauerlich, dass Taverners brillante Magnificat-Vertonungen in den Forrest-Heyther-Stimmbücher nicht enthalten sind, da die einzig vollständig überlieferte Version die vierstimmige ist, die aus einem Manuskript stammt, das 30 Jahre nach seinem Tod angefertigt wurde. Der fünfstimmigen Vertonung fehlt die zweite Tenorstimme völlig und in der sechsstimmigen ist der Treblepart nur zum Teil enthalten. Tatsächlich jedoch tun diese Auslassungen der Leistung Taverners in diesen Werken kaum einen Abbruch: einerseits ergibt sich die Tenorstimme im fünfstimmigen Magnificat größtenteils aus dem Cantus planus und andererseits ist die Treblestimme im sechsstimmigen Magnificat im letzten Abschnitt, wo die Koloratur-Passagen sozusagen in Schwung kommen, überliefert – und schließlich hat Tim Symons, unser Herausgeber, mit seiner Rekonstruktion der fehlenden Töne hervorragende Arbeit geleistet. Im Gegensatz etwa zu den drei komplementär besetzten Messen von Byrd waren diese Magnificat-Vertonungen offenbar nicht als zusammenhängender Zyklus angelegt. Man geht davon aus, dass das fünfstimmige Werk das erste ist, da es der älteren Praxis folgt, bei der die Polyphonie um einen Faburden der Cantus-planus-Melodie, anstatt um den Cantus planus selbst, herum konstruiert ist. In der vier- und sechsstimmigen Vertonung verwendete Taverner hingegen die originalen Psalmtöne – eine Technik, die eine deutlichere Präsentation der Melodie erlaubt und die zu Beginn des 16. Jahrhunderts zunehmend bevorzugt wurde. Die drei Werke ergeben eine interessante Kombination. Das fünfstimmige ist mit seiner Besetzung für tiefere Stimmen (SATTB) das ruhigste und dehnt sich am meisten in die Länge. Die Anlage der einzelnen Stimmen mutet stellenweise durch den sich entlangschlängelnden Kompositionsstil fast mittelalterlich an und erinnert den Hörer an Kompositionen des späten 15. Jahrhunderts. Im Gegensatz dazu steht die vierstimmige Vertonung: in der kompakten Anlage finden sich zahlreiche Imitationspunkte (was auf ein späteres Entstehungsdatum hinweist), jede Geste ist bedacht und dramatisch. So fällt es der sechsstimmigen Vertonung zu, mit seiner Chorbesetzung von TrMAATB und brillanten Passagen mit voller Besetzung das passendste Pendant zu der Missa Gloria tibi Trinitas zu liefern. Hier kommt Taverners Gespür für Architektur voll zur Geltung, wenn er auf die erstaunlichen Rouladen des „Gloria Patri“ hinarbeitet. Mit wem er hier wetteifert, wenn er die Stimmen um einander herumwirbeln lässt, ist reine Spekulation, doch gibt es gewisse Ähnlichkeiten zu dem Magnificat von William Cornysh, der der Komponistengeneration vor Taverner angehörte. Wenn überhaupt, dann überbietet Taverner jedoch sogar jenes äußerst anspruchsvolle Ende und präsentiert dem Hörer eine der virtuosesten Chorkompositionen aller Zeiten.